Vector files, fully editable. Includes AI CS5, EPS 8. People Play Chess Game; Travel or Vacation Accessories Flat Design; Modern House with Panoramic Windows; Lift Car on Auto Service; Modern Urban Bridge Design Flat; Freelancer Works with Laptop; Set of Equipment for Skiing. 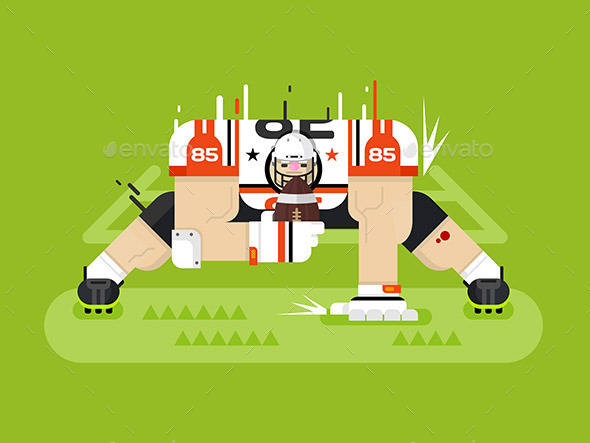 Keywords: american, athlete, ball, cartoon, champion, character, competition, field, flat, football, game, goal, helmet, icon, illustration, isolated, male, man, pass, player, pose, protection, Quarterback, rugby, sport, sportsman, strength, touchdown, uniform, vector.